Happiness was elusive for Daniel Dugec. Over three months ago, he was in his cushy job in Toronto, Canada, making good money working for a bank. Somewhere along the way, the grind became too much. Depression and anxiety set in as the 39-year-old had ballooned to 160 Kg, taking four ibuprofens a day to curb muscle pains, and was waking up in the middle of the night. Inspired by the weight loss of legendary rock musician Ozzy Osbourne’s son Jack, who shed pounds training Muay Thai, Dugec began researching camps in Thailand when he came across Tiger Muay Thai and MMA Training Camp Phuket, Thailand and the story of James Mason. Just two months later, Dugec is set to leave the camp at 137 kg – down 23 kg from his starting weight. 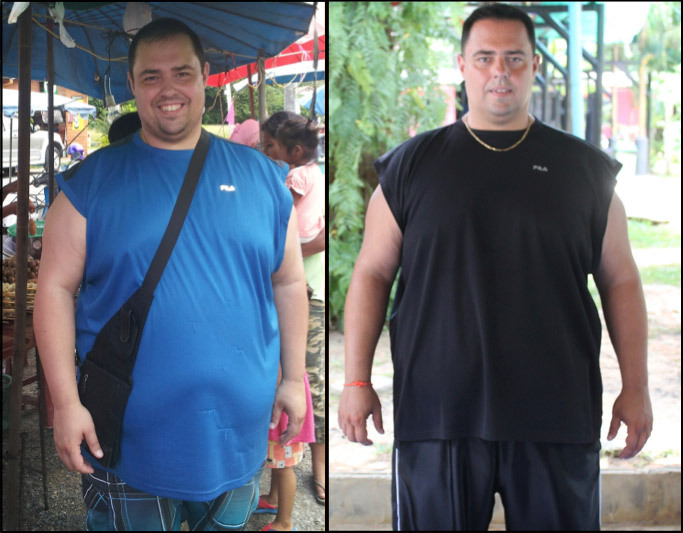 The training at TMT has put Dugec on the fast track to a healthier lifestyle, complete with better nutrition and a plan to return to Thailand for a possible 6 months to lose more weight. “I use to train at home and lose weight, but I’d put it back on after three months. Somehow, I know this is not going to happen ever again,” he says. The difference has been the support from people at the camp, the knowledge passed down to him from his trainers, and his growing relationship with James, whom he now calls one of his great friends. “He genuinely cares about my success and understands where I came from and my journey. He knows what I’m going through mentally and physically since he was in the same position,” Dugec, who was born in Serbia, says. Dugec’s ultimate plan is to slim down to 95 kg, a goal he knows will take time. He has come a long way from the one-session-a day-training he started with just two months ago.